To mark this important anniversary, AACT organizes the Symposium "100 Years Austrian Association of Cities and Towns-Contributing to strong local government in Europe". The Symposium focuses on the European cooperation of Local Government Associations, discussing their important role and activities in Europe and in the European Integration process. The Symposium brought together Local Government Associations, their international networks, such as NALAS and CEMR, the Congress of Local and Regional Authorities, as well as Mayors and municipal officials. "Today, the European unity and values are being challenged by different cryses, the refugee being the latest one. It is becoming clear that the future of unity of Europe will be secured by actions and agility of local governments and local democracy. Therefore, the EU integration should also rely much more in the local government, which has not been the case so far", said in the panel discussion Mayor Darko Fras, NALAS Vice-President. 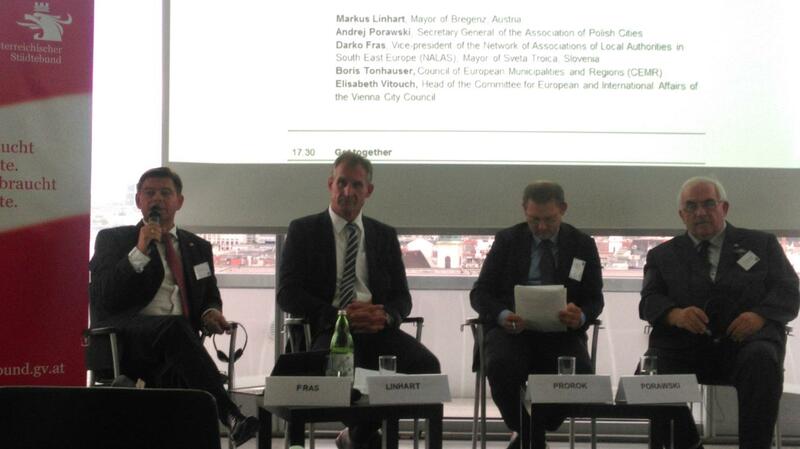 Mr. Fras emphasized that the Austrian Association of Cities and Towns, with their century-long activity sets a bright example to all countries of South-East Europe, confirming that the commitment of the representative associations can result with advancing the position of the local government for the benefit of its citizens. The whole NALAS family congratulates the Austrian Association of Cities and Towns, wishing them many new heights in the next 100 years!